e-insuranceleads.com was created by Docktor’s Insurance, Inc. While creating life insurance leads for our own agency, we discovered a large volume of high quality leads available far surpassing our ability to handle effectively. Our lead business was created to help experienced agents become more profitable, utilizing our proven methods to sell more policies. We are a boutique lead company dedicated to a good agent experience. Offering a unique lead source not available through mainstream channels. Products sold and best practices available to close more sales. Our leads are organically generated by multiple traffic sources. People requesting quotes want to buy life insurance. 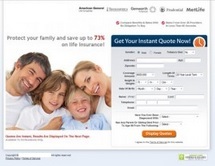 Here is an example of one website we use to produce life insurance leads. Represents multiple life insurance carriers. Services a large geographic area or have multi-state licenses. Have superior ability to sell over the phone. Utilize a CRM to handle lead volume and follow ups timely. Sell traditional life insurance and final expense policies. Interested in increasing your book of business? Contact us today and start selling more life insurance!